UF Health Shands Children’s Hospital once again ranked among the nation’s best pediatric hospitals in six medical specialties for 2018-19, moving even higher in pediatric cardiology and heart surgery and in pulmonology, according to the Best Children’s Hospitals rankings released by U.S. News & World Report. The hospital ranked among the nation’s elite in the same six specialties as it did a year ago. But UF Health’s pediatric cardiology and heart surgery program moved up two places from last year to 19th nationwide, the highest-ranked specialty at UF Health Shands Children’s Hospital. That also is a historically high ranking for the program. Additional rankings included pulmonology, which moved up 11 spots from last year to 22nd, also a historically high ranking. The other ranked specialties were diabetes and endocrinology (27th), neonatology (39th), cancer (49th) and neurology and neurosurgery (50th). The hospital’s pediatric cardiology and heart surgery program was the highest-rated in Florida for the third consecutive year. Also ranked highest in Florida were pulmonology and diabetes and endocrinology. 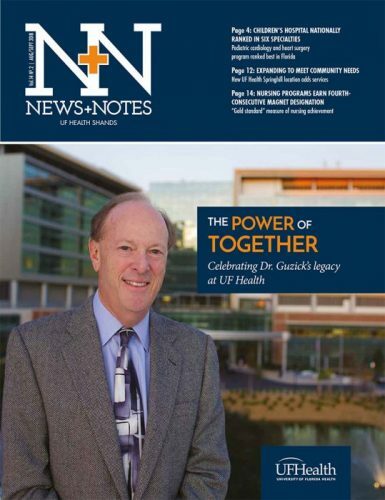 “The rankings by U.S. News & World Report confirm that UF Health Shands Children’s Hospital continues to be viewed as one of the top children’s hospitals in the country,” said Scott Rivkees, M.D., chair of the UF College of Medicine’s department of pediatrics and physician-in-chief of the UF Health Shands Children’s Hospital. “We are especially gratified that several of our divisions have achieved even greater recognition than in the past. Most importantly, these rankings reflect our continued commitment to children and their families, who travel near and far to see us for our expert care,” Rivkees said. Mark Bleiweis, M.D., director of the UF Congenital Heart Center and the chief of congenital cardiothoracic surgery, said it was a great honor to once again see the pediatric cardiology and heart surgery program recognized for its excellence. Michael Light, M.D., the chief of the UF Health Shands Children’s Hospital pediatric pulmonary division, said his division’s historically high ranking is a result of its robust growth in recent years. Ed Jimenez, UF Health Shands CEO, said these rankings show a pediatric hospital performing highly and consistently on all levels. The U.S. News Best Children’s Hospital rankings are compiled from clinical data and an annual reputational survey of pediatric specialists across the country who were asked where they would send the sickest children. Other factors that determine rankings include survival rates after surgery, adequacy of nurse staffing, procedure and patient volume and other information. The rankings will be published in the U.S. News & World Report’s “Best Hospitals 2018” guidebook, available on newsstands in September.